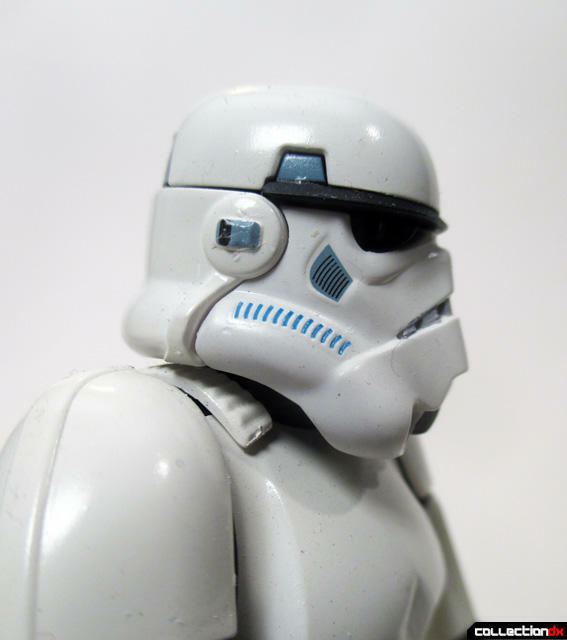 Like many people who lived through the 70’s and 80’s, Star Wars ruled our daily lives in the form of movies, comic books, model kits and a fantastic toy line from Kenner. 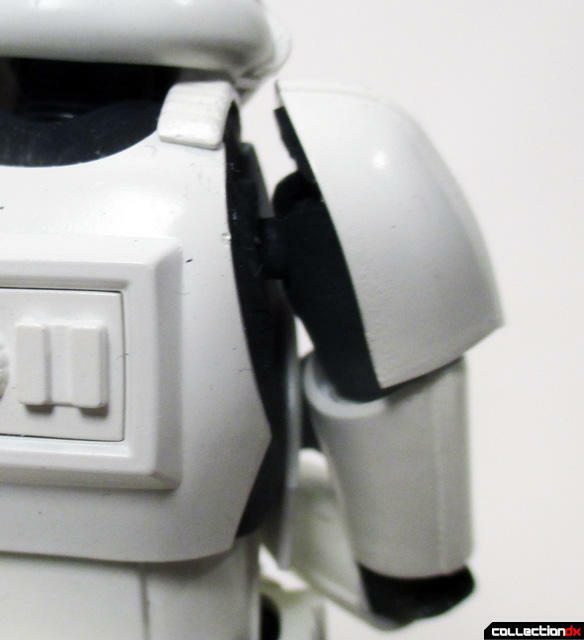 For many of us as the decade closed out, new interests took its place but for many of us Star Wars still had a huge place in our hearts although it would remain dormant until the next decade. 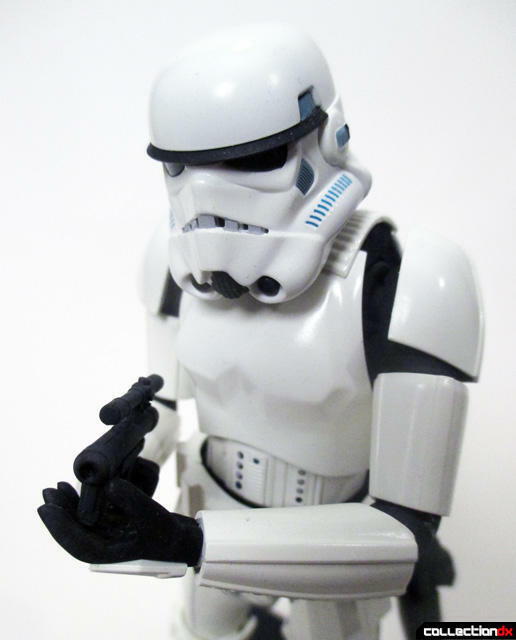 Since the 90’s when new Star Wars toys started to hit the market again I have been very good at resisting the collecting bug. Even Lego Star Wars and Fine Molds model kits were temping for me but I still held out against the onslaught of great Star Wars items. That is until now. 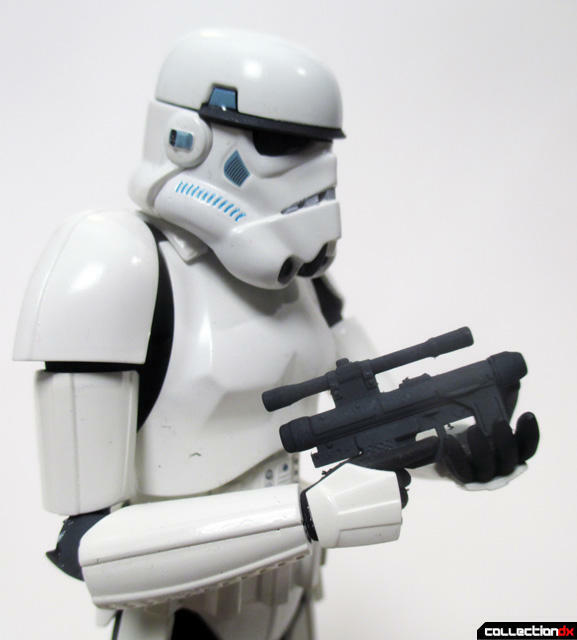 Last year, seemingly out of nowhere, it was announced that Fine Molds would no longer hold the license in Japan for Star Wars model kit products and that Bandai would now be the new holder of the license. Nerd rage paranoia abounded across the Internet most of it being ridiculous but with a few valid points by some. 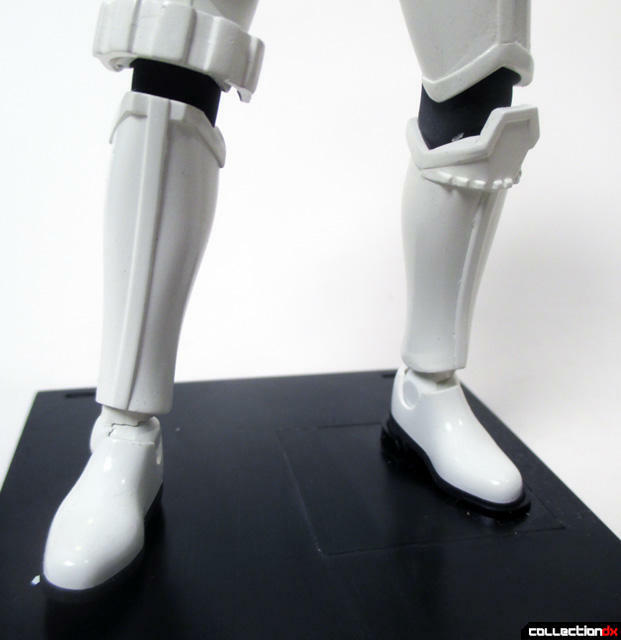 The big overall issue is what kind of quality was Bandai going to have with their kits compared to the excellent boutique quality of Fine Molds kits? 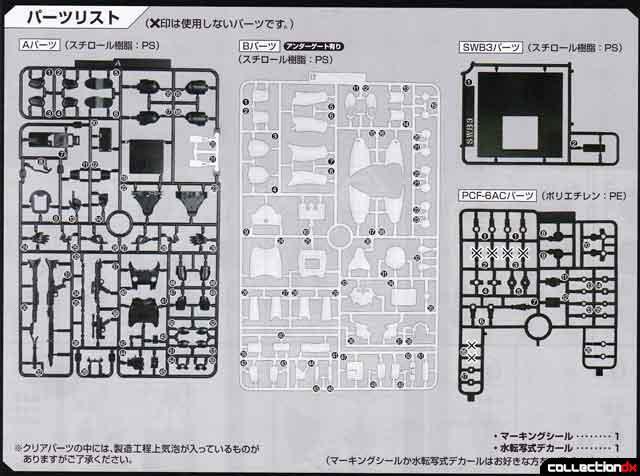 Fine Molds had set a very high standard that Bandai would have to equal or surpass if they were to gain credibility with Sci-fi model builders who never have built Gunpla before. 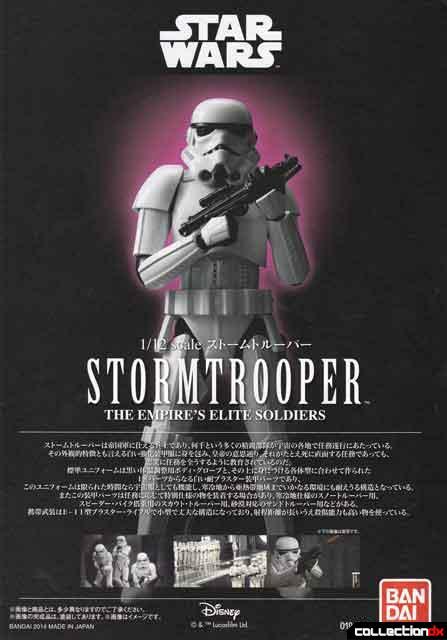 Already a year into Bandai’s Star Wars model kit line we’ve been treated to over a dozen wonderful kits, with Bandai’s 1/12 Stormtrooper being one of the first kits made available. 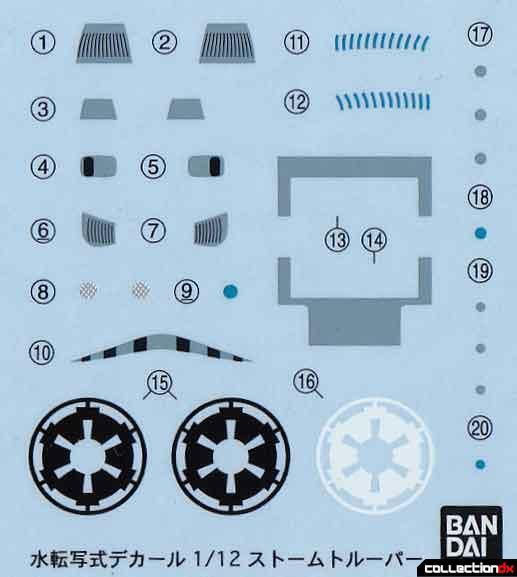 With my first attempt at a new Bandai Star Wars kit, how will the quality compare to other Bandai kits and other previous Star Wars model kits? 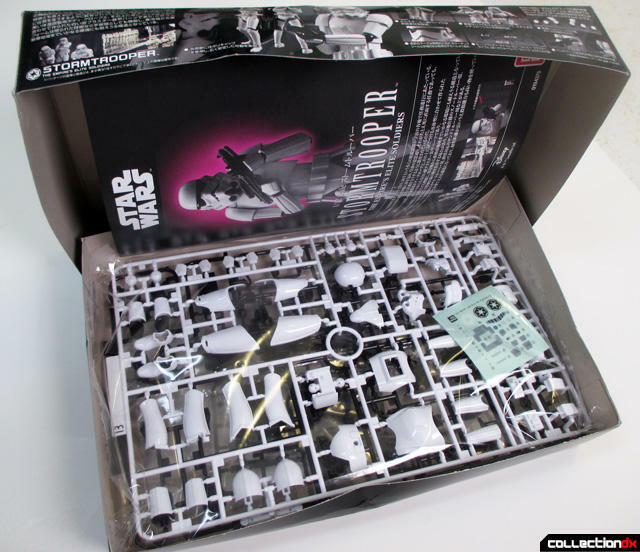 1/12 Stormtrooper is boxed and includes: 1x Black Sprue, 1x White Sprue, 1x Stand, 1x Polycaps, 1x Sticker Sheet, 1x Decal Sheet, 1x Dark Clear Green sprue, 1x Full color instruction sheet. 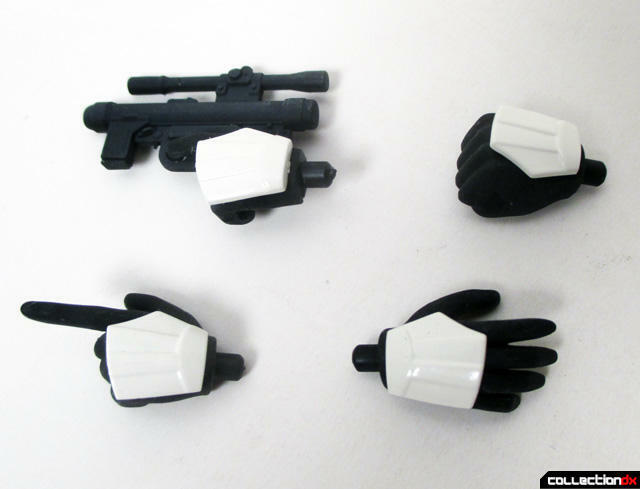 Options include three types of blasters and holster, stickers or water slide decals, various hand options. The first feature I was impressed with was the color the white sprue was colored with. 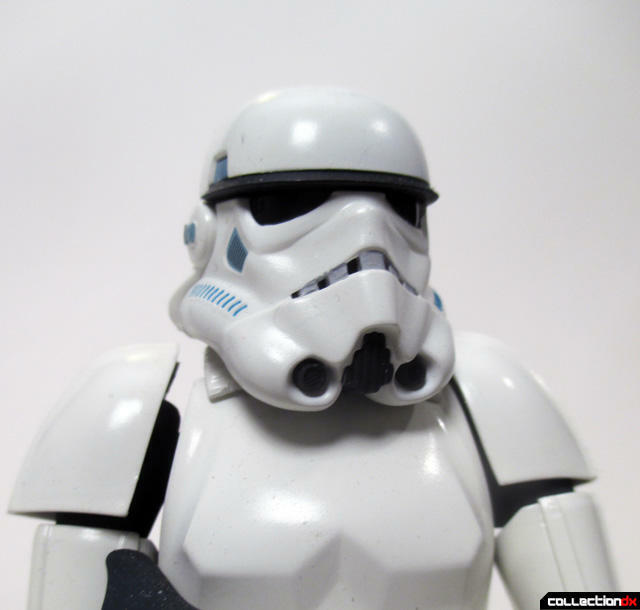 It wasn’t a straight bright white but a nice greyish white that accurately portrayed the color of the Stormtrooper armor correctly. I was impressed with the nuance of the molded color, so much so that I was hesitant to even paint it, as it looked so good! I tend to separate all the major parts from the sprue and put them in small plastic sealable bags for each section, such as waist and torso in one bag, weapons in another etc. 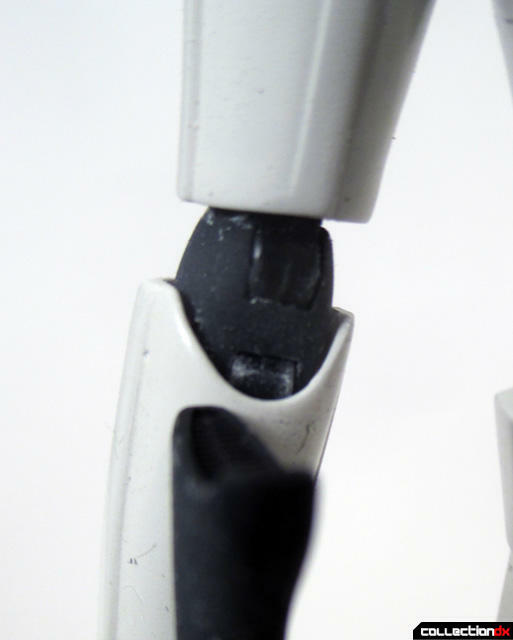 The major white amour component parts and black joints are separate from each other and can be snapped together after the painting is completed. The only seam that needs to be sanded is the one behind the helmet. All other part seams in the armor is hidden behind or beside the raised portion of the armor making a nice tight fit. If you are using glue be carful as the glue can spill out along that seam. The rear belt canister is also two parts, careful not to sand away any if the detail when cleaning up that seam. 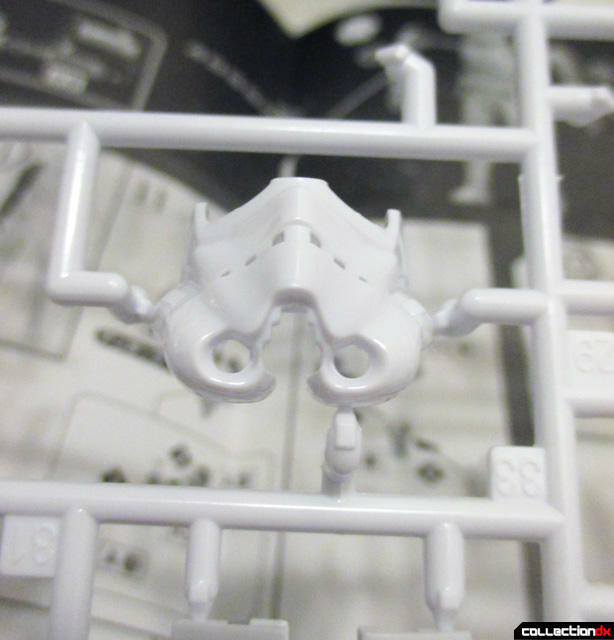 Otherwise items like the body and shoulder armor are one piece, ready to paint once off the sprue and cleaned up. The helmet is four major parts, the front lower portion, two part back portion and the top of the helmet. Although I did not do it this time the I suggest also gluing and filling in the small seam in the front lower and back portions. The black line and the green eye lens, which are their own parts, can easily be put in after painting. The black body and joint portions also have some seams to fill, nothing out of the ordinary but these seams need to be filled before they are painted. 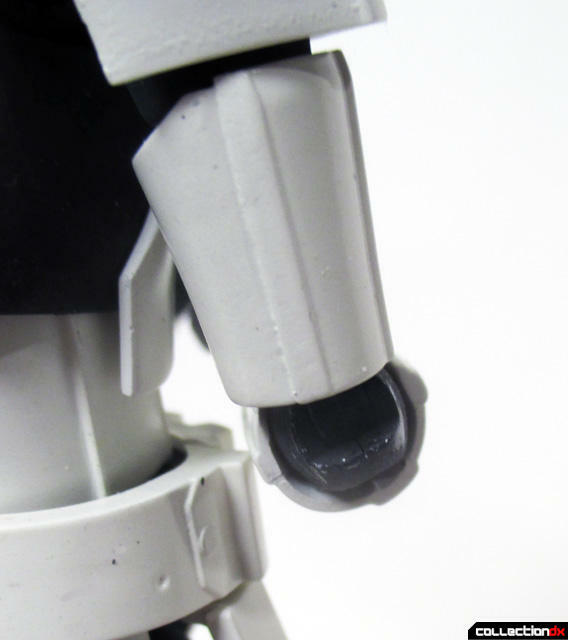 I did experience some fit issues with some of the elbow and knee joints that necessitated modeling filler putty. Part of the issue is the rubbery poly cap material that can be inserted incorrectly and not tightly closing. 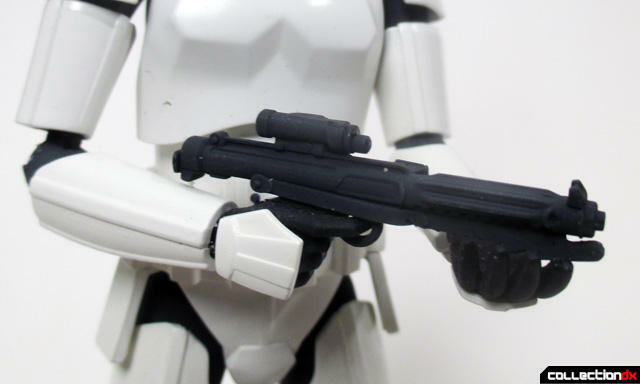 If you are going to airbrush the parts I suggest using a flat black then highlighting it with Tamiya German Gray so it doesn’t look too monochromic, a common problem with spraying a single dark color. 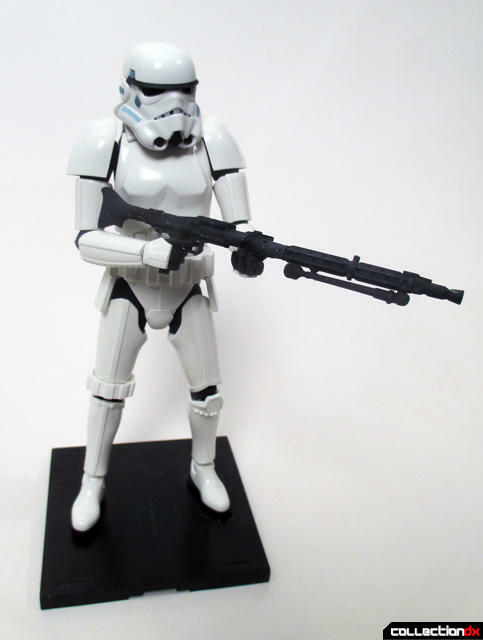 What is great is that this kit comes with three weapons, the standard rifle and blaster and a smaller blaster I am not familiar with or never really noticed before in the films. The detail of these are fantastic, especially the larger rifle. 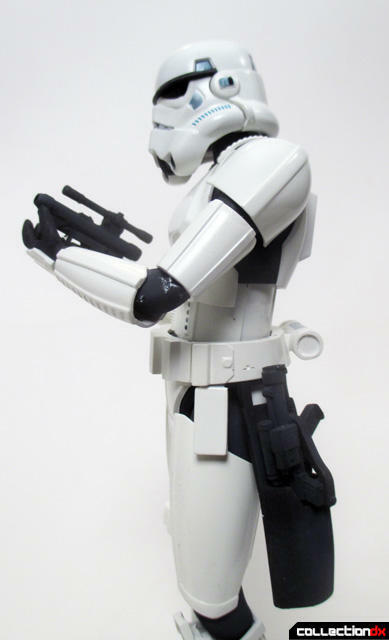 A holster is included for the two blasters, but it is molded in the rubbery poly plastic and needs a coat of primer for paint to stick to it. When I finally assembled the kit together I had some issues of the white belt not snapping completely onto the waist due to the holster. There might be some parts trimming I have to do to get it to fit correctly. I also painted the weapons using a flat black undercoat highlighted with German Grey, which made the weapon details pop. This kit came down to one thing, should I paint this kit or not? As I stated before, I love the glossy plastic color on this release. For the first time ever I wrestled with idea of actually painting a model kit. Eventually, after much heartache, I decided on painting the kit, I ended up using Gunze Mr. Color Gloss White as its an off white that looks great although it is a bit more tan than gray. After a Tamiya White primer undercoat I painted the various parts, which came out very nice. Talking with many modelers there is a general consensus that Bandai decals on modern kits are not that great. I will have to say I had a 50/50 opinion on them while some fit and sat quite well, some lifted from the glossy surface and did not bond well. Easily fixed with Solvaset but not something a modeler does not like to see. There are stickers included if the modeler chooses to use them instead of the waterslide decals. 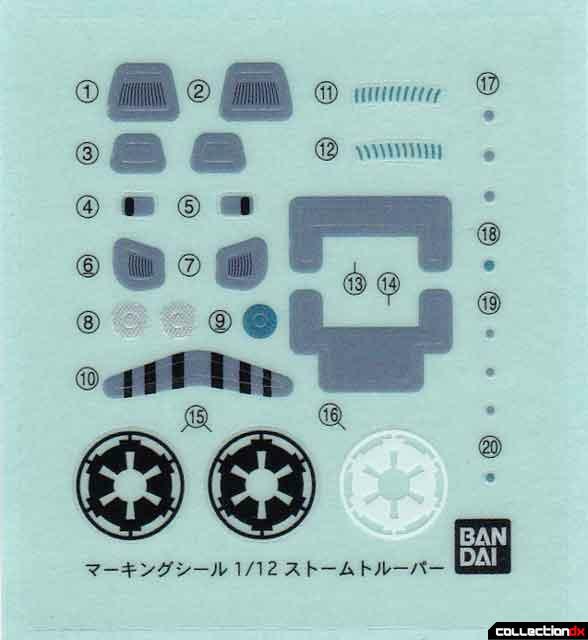 Like most Bandai kits many of the painted areas are represented in either color plastic or decals/stickers. I used many of the decals but decided to hand paint some of the smaller decals. These included the colored buttons on the waist area and the grey in the mouth vent area. One of the aspects I needed to consider when painting the kit was the semi-gloss nature of the armor as seen in the film. Flat paint would not look correct nor would high gloss look good either. I ended up using a Gunze Clear Semi-gloss right out of the can and it captured the look of the semi gloss appearance in the film very well. 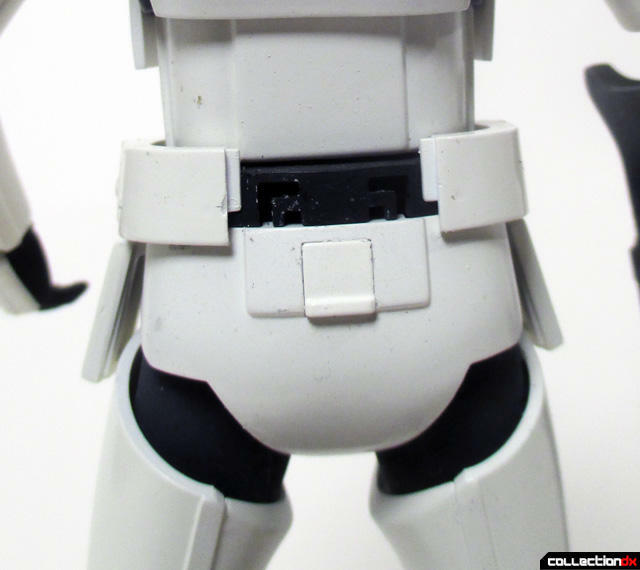 I decided not to do any weathering or washes on the kit to keep with the sterile look of the armor as seen on the Death Star, although there are a lot of great opportunity to do so, especially in the waist area. 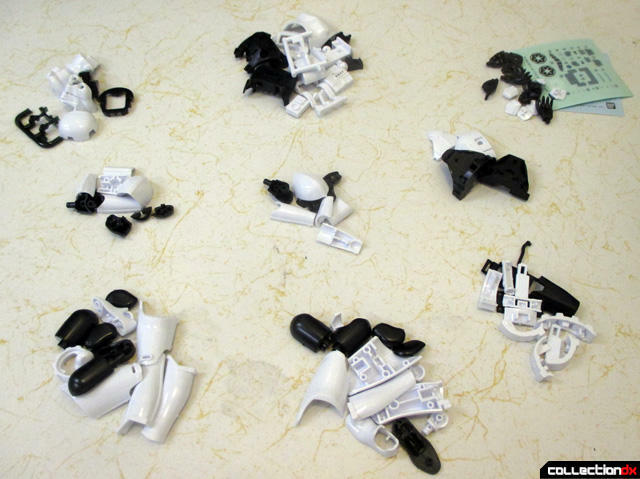 Once all the parts are painted and dried its assembly time. 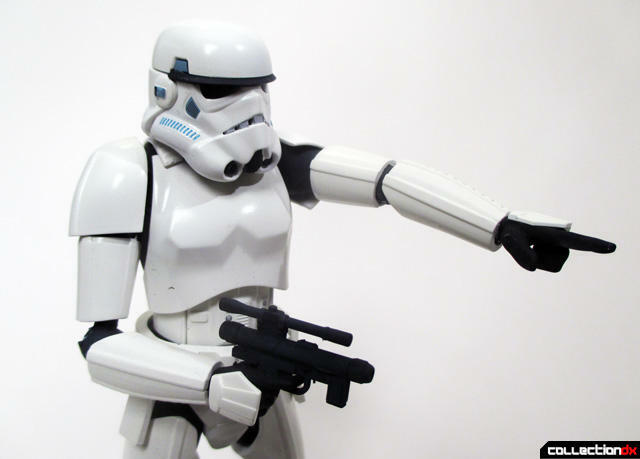 If you have built Gunpla assembling one of these Stormtroopers is the same. All the parts snapped together just fine and the fit is tight but good enough to pose the figure if you desire. The belt can be a bit tricky especially if you are putting the holster on. They should have a tight fit but due to the handing parts they do not fit snug like they should. The only major issue I had are with the elbows. It is a unique joint system that is on two slides that insert into the shoulder and forearm. 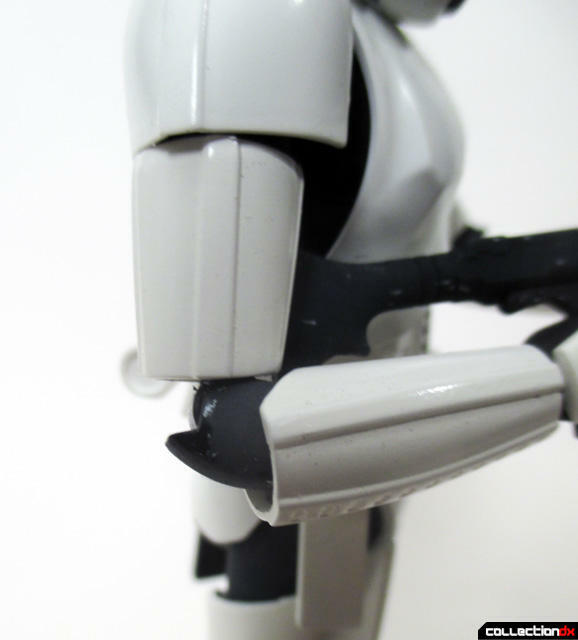 When the elbow is bent they side out and give enough clearance to bend the arm. Unfortunately it always seems to fall out of one of the holes. 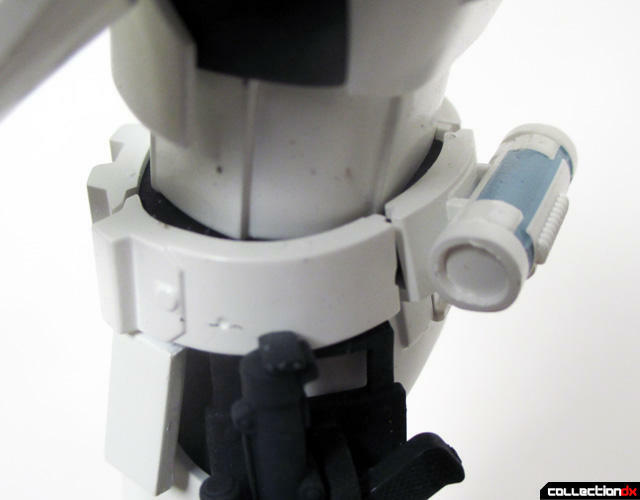 Due to the rubbery nature of the slides, the part does not feel it is even inserted into the forearm or shoulder correctly. These joints do not feel as solid as the rest of the kit joints. Multiple hands are included in various poses, which is typical of your standard Gunpla release. The only unfortunate issue is that although three guns are included with this release only two trigger figure hands are included. These snap apart but if you want to attach it to a gun and glue and fill the seam you will have to leave one hand unglued to switch between the other two guns. 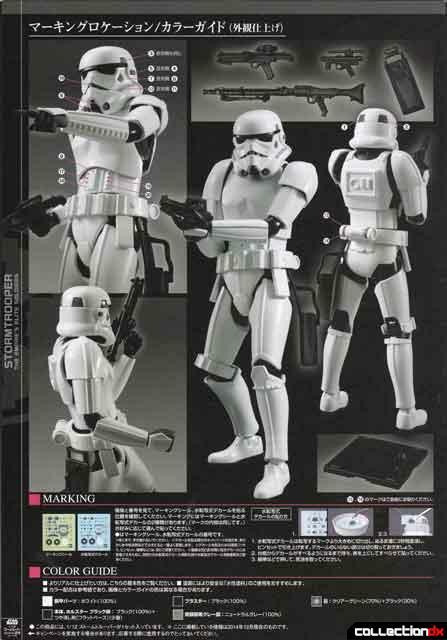 I figure most Star Wars modelers are going to want at least two of these kits so an extra hand will be available for all three weapons when two kits are bought. A stand is included with this release that can be attached to another stand using a simple joint attachment. A tile from the stand can be flipped around one side being smooth the other side an outline of the boot for the shoe to fit in. 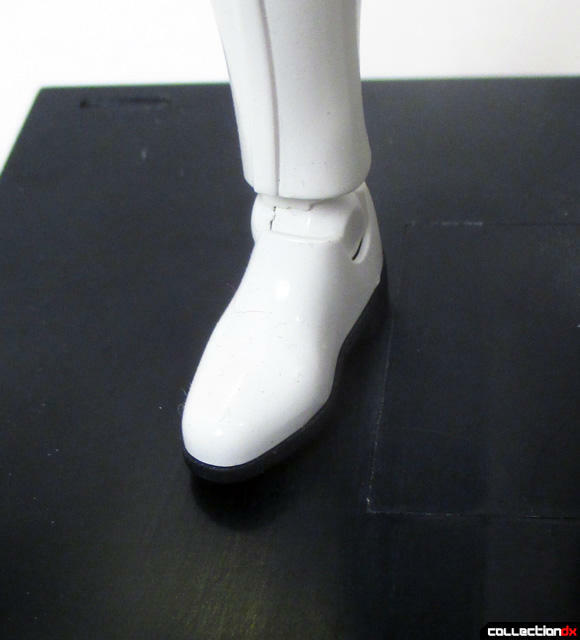 I chose to glue in the tile with the boot outline facing out as the weight of the figure tends to pop the tile out of the stand. The stand works good enough and looking forward to plugging it into other Star Wars bases. 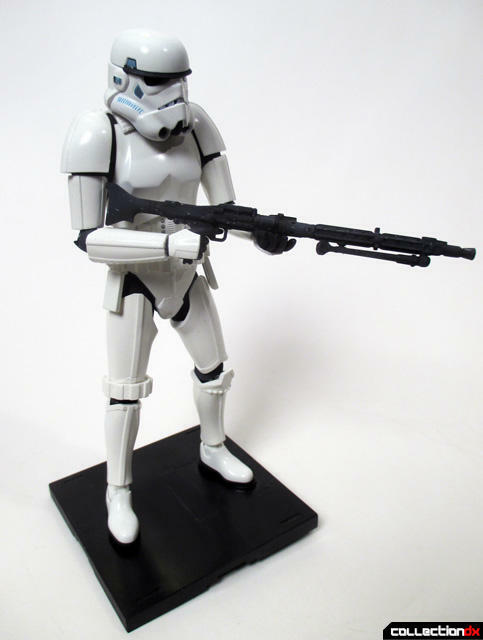 Bandai’s Action Stand 2, which is sold separately, can also be used for this kit as there is a place to insert the stand into the back of the figure. 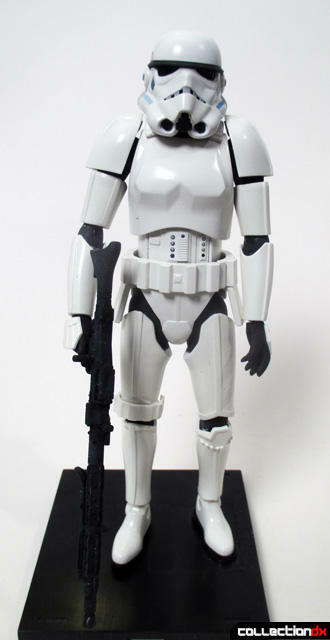 The figure has great poseability and can get some of those classic Star Wars poses as seen in the films. 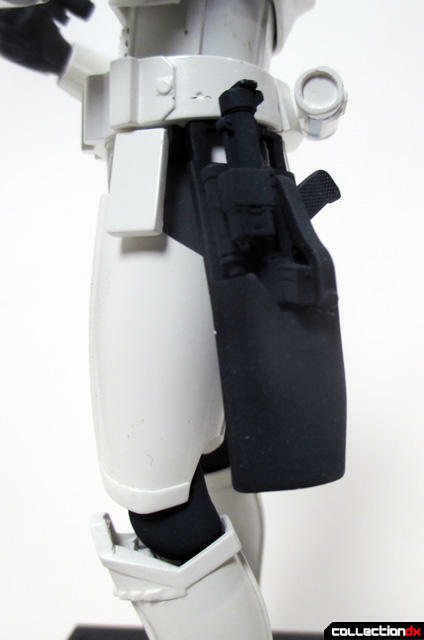 I really like the look of the stance of the figure holding the rifle blaster. 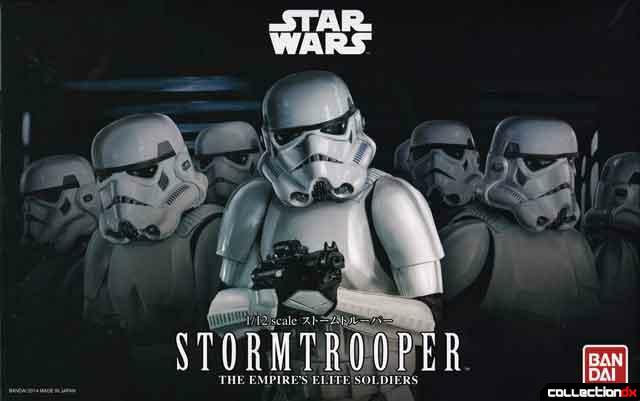 As much as I like this release the only issue some people might have with this release is that its not a complete screen accurate portrayal of the Stormtrooper armor as seen in the film, most of these have to do with poseable aspects of the figure. 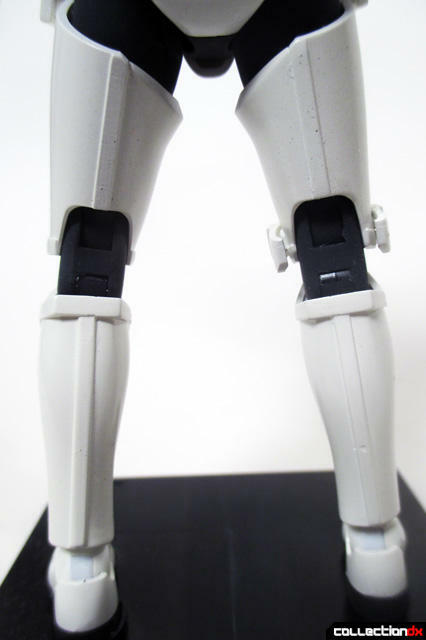 Areas such as the feet and lower armor are compromised for poseability. Areas such as the back of the shoulders create big gaps and honestly don’t look very good. There will be a fair amount of scratch building to get the kit to that level but overall it’s a beautiful release. I must say this is one of the most fun model kits I have ever built, it was just a blast putting it together and admiring the wonderful details of the kit while still being in shock that the kit even actually exists. The low price point of such an iconic subject makes it a must pick up by everyone, and I do mean everyone including somebody who wants to build model kits but doesn’t know what kit to start with. Even not painted, using the molded plastic color, the kit is a winner. Advanced modelers would just enjoy letting their hair down and building such a fun and well thought out model kit that can be built and finished in such a short time. This is the kit you you've been looking far. As a modeler and toy collector I’ve resisted so many Star Wars products for so long but Bandai’s Star Wars Model kit line seems to be mostly a winner overall and looking forward to building some more kits from this line. ©2015 Photos and review by Leonardo Flores and CollectionDX. I just got the R2-D2 combo yesterday and C-3po is coming today and i gotta say i'm stoked! 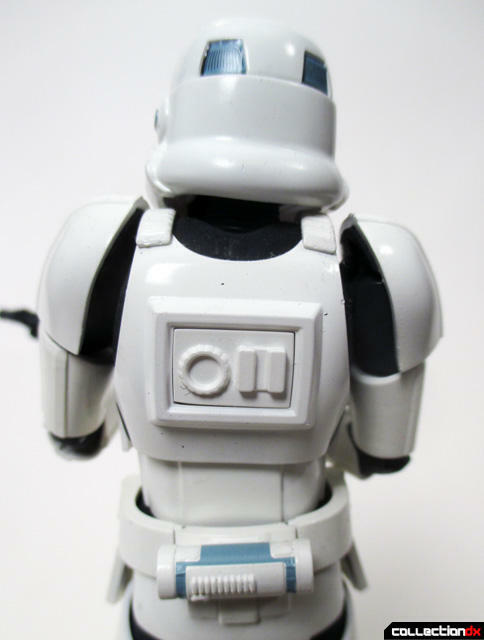 I plan on getting all of them along with multiples of the storm trooper. Also, I saw that Boba Fett is in the pipeline. I really hope they keep the 1/12 line going. Your work really pops, it's incredible. 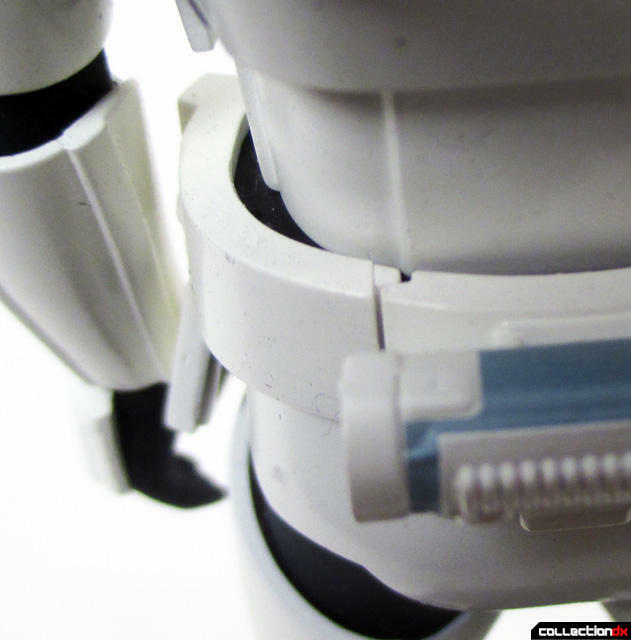 Blown away with your AT-ST recent Gundam reviews! How well did the stickers match the bare plastic? How about the adhesive? Does it feel like they'll be peeling up after a few days? 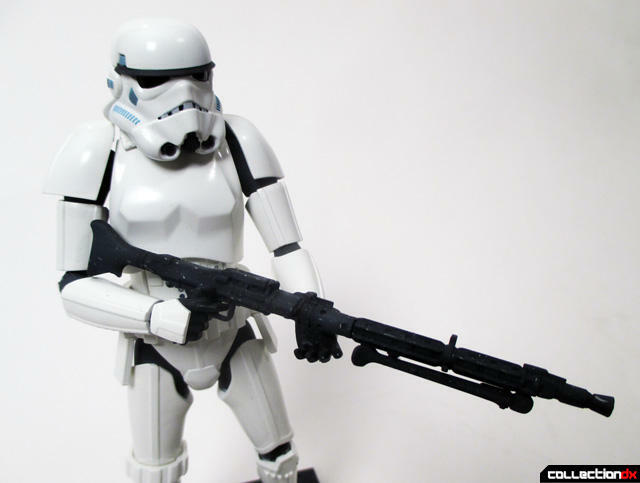 I am thinking about ditching my Black Stormtroopers and replacing them with a couple of these. They look so much more accurate than Hasbro's attempt. I sure don't have the time to try and paint them or anything, though. I used the waterside decals, so I am not sure how the stickers are. Unpainted they look great, I think you will enjoy the kit, I really had to fight myself NOT to paint it, the first time I think that's ever happened!